With a current price tag in the three thousand dollar range, one would expect the HP Color LaserJet 5550 to seriously deliver raw power and performance with full color laser printing technology, and the device does not disappoint. As one of the fastest color laser printers on the market, the HP Color LaserJet 5550 is capable of producing a massive amount of full color output in a minimal amount of time. With a print speed of up to 27 pages per minute in color at full quality, the unit is perfect for businesses that require large volumes out color output at a bare minimum price per page. Black and white documents and imagery will also come out as fast as 27 pages per minute. The HP Color LaserJet 5550 was released in 2007, but it is far from dated. Its maximum monthly duty cycle of 120,000 pages allows it to withstand almost constant abuse from a single user or an entire office network. HP recommends a duty cycle of only 2,500 to 10,000 pages, but this amount should still prove to be sufficient for most business applications. Additional options such as an internal hard disk allow for optimal print speed of commonly used data such as application forms and company logos, while a built in 533 MHz processor ensures that slowdown will remain at a minimum when dealing with large projects. The HP Color LaserJet 5550 series includes three distinct model variations, each with slightly different traits. 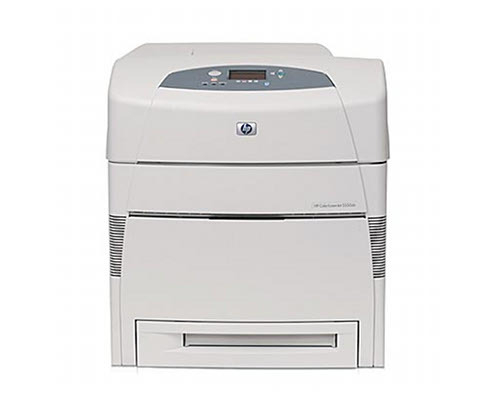 The HP Color LaserJet 5550n model includes built in network capabilities while the HP Color LaserJet 5550dn also includes an internal duplexor. 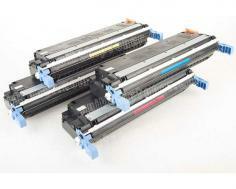 Both models come complete with 160 MBs of internal RAM, while the HP Color LaserJet 5550dtn model includes 288 MBs. All three models are upgradable via open DIMM slots, but only to a total of 544 MBs. An additional paper tray is also included with the HP Color LaserJet 5550dtn model which brings the unit’s total paper storage capacity up to 1,100 sheets instead of only 600. For such a high price tag, the HP Color LaserJet 5550’s print quality specifications are absolutely unacceptable. With a maximum true print resolution of only 600 x 600 dots per inch for both black and white and color, the printer is entirely sub par when compared to color laser printing devices that cost hundreds of dollars less. Additionally, the HP Color LaserJet 5550’s first page out times are very slow considering the cost and power of the device. Both black and white and color material will cause users to wait a full 16 seconds before the first page of product appears. Review it: "HP Color LaserJet 5550 "
Like almost all color laser printers, the HP Color LaserJet 5550 relies on not one but four individual toner cartridges to produce vibrant color. 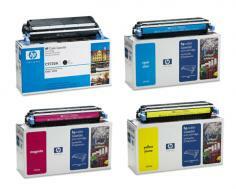 The four cartridges come in black, cyan, magenta, and yellow, and can be replaced individually depending on usage. Each black cartridge offers a 13,000 page yield at 5% coverage while the color cartridges fall slightly behind with 12,000 pages of yield each.